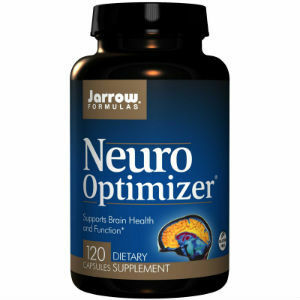 In this article, we will review the supplement Jarrow Formulas Neuro Optimizer. This supplement was devised to provide the brain with nutrition and enhance brain metabolism to support overall brain health. Furthermore, Neuro Optimizer supports brain function. Read on in order to discover ingredients found in this product and what our opinion of it is. Phosphatidylcholine gives rise to citicoline, which makes up gray brain matter, restores phospholipids to the brain and enhances brain metabolism by aiding in the synthesis of acetylcholine. Phosphatidylserine helps the brain to deal with stress. Acetyl-L-Carnitine, Alpha Lipoic Acid and Taurine are antioxidants that protect neurons. Taurine also assists in osmoregulation inside cells. This product is non-vegetarian as it contains gelatin. Four (4) capsules should be taken per day with juice or water between meals or as directed by a medical professional. There is soy in this product, which can cause an allergic reaction in some people; the severity of the reaction varies depending on the severity of the allergy. Those who are pregnant, lactating, trying to conceive, have a medical condition, under the age of 18 or taking medications should consult with their physician prior to taking Neuro Optimizer. 120 capsules, or a 30-day supply, is $49.95 when bought at full price but can vary from retailer to retailer. The price amongst online retailers varies but the lowest prices are offered by Amazon for $25.32 and by Pro Vitaminas for $29.97. The same retailers have offers on more than one bottle. Pro Vitaminas has a deal on four bottles of Neuro Optimizer at $99.99 although that amount would be expected to retail at $199.98 and Amazon sells two bottles for $57.79. There are many retailers across the United States and some international ones that sell Neuro Optimizer as well but the price they sell the product is unknown. Jarrow Formulas have not provided consumers with a guarantee. Different retailers may have their own guarantees but the manufacturer itself does not uphold one. This could show a lack of faith in their product. Neuro Optimizer has received two highly positive reviews found on the Jarrow Formulas website. It is difficult to judge overall customer satisfaction from this scant number of reviews. However, the reviews on Amazon for this product suggest that it is highly effective as well over 100 reviews have been given and the supplement has achieved a 4-star rating overall. Customers seem to be generally satisfied with this product so while the high dosage may suggest that the supplement is weak, Neuro Optimizer seems to be effective enough. Side effects are not explicitly stated, and those who should not use it without consulting with a medical professional are clearly listed. However, the product does contain soy, which is an allergen, and this is a fact that could be better advertised. The cost of Neuro Optimizer can be considered fair, especially as some retailers offer it for a very reasonable and affordable price. Unfortunately, Jarrow Formulas do not have a guarantee, as the product cannot be bought from them directly. This means that the consumer must look into the guarantee of whichever retailer they purchase it from. Furthermore, a lack of a guarantee seems to point to a lack of confidence in the product on the part of the manufacturer. Lastly, the product is non-vegetarian and so some consumers will be put off by it. Ultimately, Neuro Optimizer seems to be a supplement that has its benefits as well as its drawbacks. Henry Costa	reviewed Jarrow Formulas Neuro Optimizer	on November 20th	 and gave it a rating of 3.